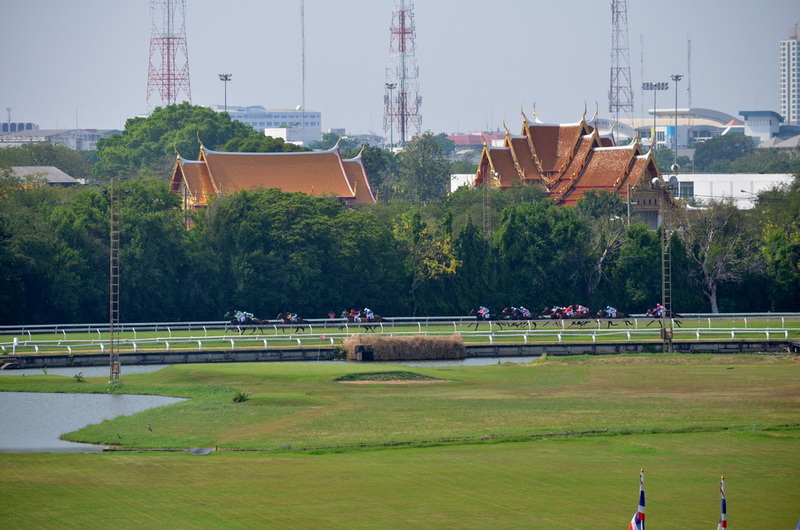 This entry was posted in Travel and tagged Thailand on May 26, 2015 by Bobby Amoroso. Our daughter arrived in Bangkok in October 2011 during the worst flooding in a century. We worried from afar, what with the dire images on the news. But when we spoke with Emilia, she sounded calm, extraordinarily so. She credits Buddha. No, she hadn’t converted to Buddhism. She wasn’t praying, chanting or meditating. She was merely observing. When we visited her two years later, we understood. No matter where you are in Thailand, you can no more escape the tranquil statues of Buddha than you can the omnipresent billboards and public shrines to the king or the ubiquitous 7-Eleven convenient stores. They are everywhere, especially Buddha. Standing. Sitting. Reclining. During the floods, Emilia remembers seeing one of Thailand’s most famous statues, the reclining Buddha of Wat Lokayasutharam in Ayutthaya. It’s made of brick and plaster and stretches more than 120 feet long, its head propped up on its right hand and elbow. Thai people, Emilia would come to learn during her time living and working among them, have a uniquely Zen way of dealing with life’s constant, myriad challenges. Every Buddha is a reminder. We had many reminders in Wat Po. That’s where Emilia led us when we traveled to Bangkok to visit her. One of the city’s most revered and popular attractions, Wat Po is a sprawling collection of temples named for the monastery in India where Buddha is believed to have lived. Golden Buddhas, more than a thousand of them, can be seen everywhere. Their hands and fingers are positioned to signify different aspects of Buddha’s enlightenment. A popular pose has Buddha sitting with his legs crossed, his left palm resting on his lap facing up, his right hand cupping his knee. This pose is Buddha calling the earth to witness the truth. It is pure serenity. But people flock to Wat Po mostly for the giant reclining Buddha, which is more than 140-feet long, and at his head, nearly 50 feet tall. (When President Obama visited Bangkok shortly after his re-election, the Temple of the Reclining Buddha was his first stop).You remove your shoes before you enter the gilded temple and are immediately drawn to the Buddha’s lazy eyes and sweet, mysterious grin. His feet, with mother-of-pearl soles, are a block away. The only sound within is the soft chanting of the prayerful and the deep, resonating tones of coins being dropped into one of 108 bronze pots; donations are said to bring good fortune. While some reclining Buddhas, with their left arm folded, represent the enlightenment that comes after death, the Reclining Buddha of Wat Po, his left arm resting on his hip, is merely sleeping. He seems to implore us to slow down, stay calm, move gently through the world. Back on the streets of Bangkok, whether in a tuk-tuk or taxi, chaos reigned. I never experienced such gridlock. Every thoroughfare swarmed with cars, trucks and motorbikes belching exhaust. Yet in all this motorized, jostling frenzy of humanity, you rarely heard a horn leaned on in anger or saw a fist waving in road rage. There was a palpable peacefulness in this lack of hostility. 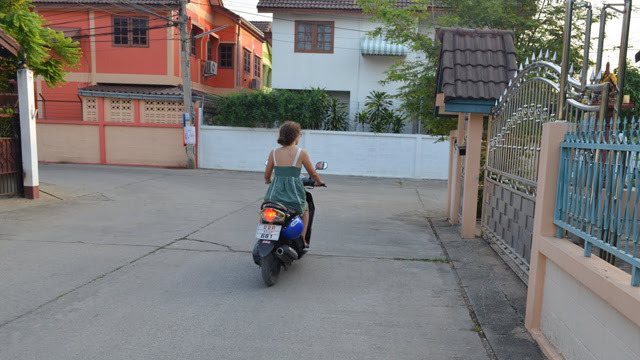 As Emilia learned and later reminded us, in Thailand, it’s the way of the Buddha. 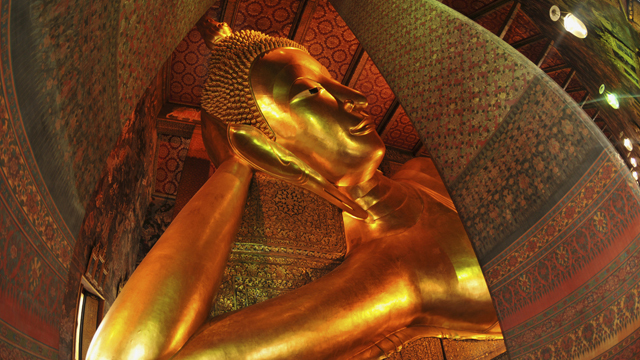 This entry was posted in Travel and tagged Bangkok, Buddha, Reclining Buddha, Thailand on August 25, 2013 by Justin Catanoso.